Build a Patio for Your Daddy-O! Grilling season is here! Give Pop a patio so he can sizzle in style! Just in time for Father’s Day, enjoy a 15% discount on a new patio 200sq.ft. or larger when you sign a contract by June 17th. Patios are a great way to create an outdoor space that ties in seamlessly with the house’s interior and expand the living space for the homeowner. Whether modern, southwestern, classic, or French Provencal, any style of architecture can be incorporated within a hardscape. Depending upon the size of your yard, for example, you can include a full outdoor kitchen for parties or evenings it’s too nice to stay indoors. Including a pergola can add definition to a space and separate spots for play and rest. It also gives you a great way to hang outdoor lighting. A pergola is a great way to give your guests refuge from the sun while still allowing them to enjoy the light. Having a small lot, or even no lot at all, doesn’t necessarily mean you can’t have outdoor living space. Using a diagonal design can trick the eye and make the most of a tiny space. For apartment dwellers, consider putting in a rooftop or balcony patio, using pots and plants such as lavender or rosemary, which are not only fragrant but also wind resistant and hardy. Whatever your outdoor needs, Ben has the solution. Give Algiere’s a call and let’s give Dad a man cave in the great outdoors! 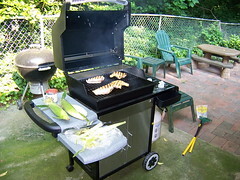 This entry was posted in Hardscapes, home improvement, patios and tagged Area, Barbecue, Barbecue grill, Black & Decker, Connecticut, Eastern Time Zone, Family, Father, Father's Day, Furniture, Garden, grill, Hardscape, Home, landscaping, Lighting, Lights, local business, Parenting, Patio, Pergola, sales, smallbusiness, speccials on May 23, 2012 by mspetersonexplains.